Isothermal chemical degradation of ascorbic acid (AA) can follow, simultaneously, two major pathways: "aerobic," where it is first oxidized to dehydroascorbic acid (DHAA), and "anaerobic," where it is not. The second mechanism is much slower, and thus the degradation curve may appear as having an asymptotic residual concentration of AA. 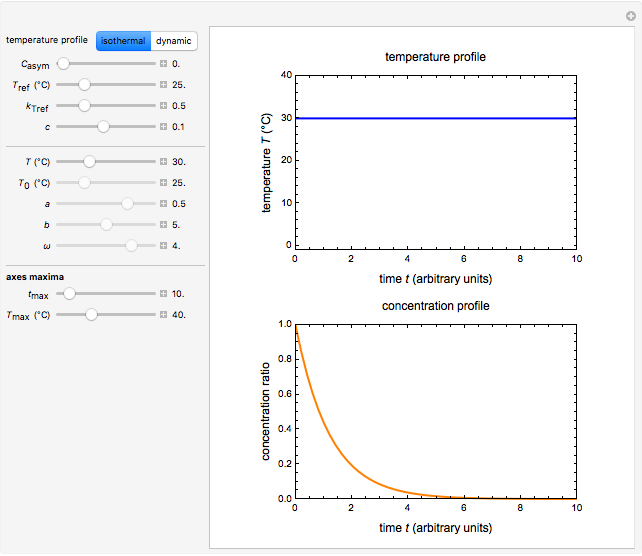 This Demonstration simulates such degradation patterns, which start by following first-order kinetics and end up in an asymptotic concentration ratio. It also simulates dynamic (i.e. 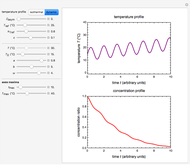 nonisothermal) degradation curves during oscillating linearly rising and falling temperature regimes. When the two mechanisms operate simultaneously, experimentally observed degradation curves, based on the diminishing AA concentration, frequently follow the model where is the time-dependent concentration ratio , is the asymptotic residual concentration ratio , and a temperature-dependent rate constant [1, 2]. Thus, where , the decay follows the conventional first-order kinetics. The temperature-dependence of has been traditionally described by the Arrhenius equation [1, 2]. It has been shown that experimental versus data described by the Arrhenius equation can also be described by the much simpler exponential model without sacrificing the fit [3–5]. In this model, is the rate constant at an arbitrary reference temperature , both and are in °C, and is a characteristic constant having units . Incorporating so defined into the isothermal degradation equation renders the general isothermal model . For a nonisothermal temperature history , we assume that the AA's momentary decay rate is the isothermal rate at the momentary temperature , at a time that corresponds to its momentary concentration ratio . Implementing this assumption renders the general degradation model in the form of the numerical solution for of the rate equation where . The boundary condition is . 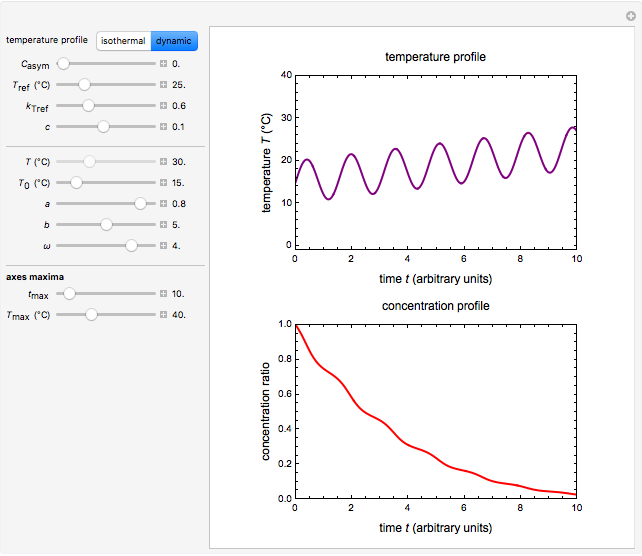 In this Demonstration, you can choose between simulating isothermal degradation patterns of AA at chosen constant temperatures and dynamic degradation patterns of AA at linearly rising and falling oscillating temperatures as examples. 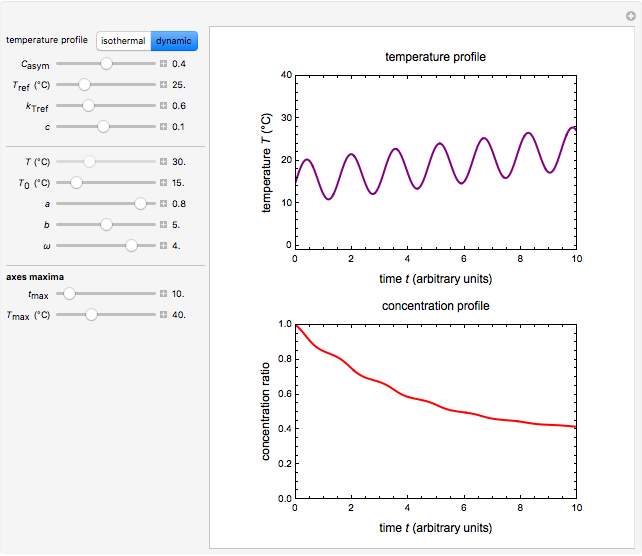 You can vary the AA's degradation kinetic parameters, namely, , , and . 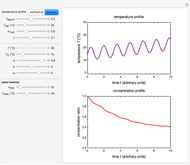 You can also vary the chosen constant temperature or dynamic temperature profile parameters , the initial temperature in °C ( ), the slope of the temperature rise ( ) or fall ( ) in units , the temperature oscillation's amplitude in °C, and , their frequency in units of . 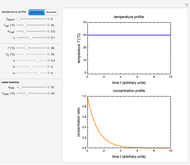 Notice that certain combinations of , , and in the dynamic temperature profile equation will render the isothermal solution for the initial temperature . M. C. Viera, A. A. Teixeira, and C. L. M. Silva, "Mathematical Modeling of the Thermal Degradation Kinetics of Vitamin C in Cupuaçu (Theobroma grandiflorum) Nectar", Journal of Food Engineering, 43(1), 2000 pp. 1–7. doi:10.1016/S0260-8774(99)00121-1. L. Verbeyst, R. Bogaerts, I. Van der Plancken, M. Hendrickx, and A. Van Loey, "Modelling of Vitamin C Degradation during Thermal and High-Pressure Treatments of Red Fruit," Food Bioprocess Technology, 6(4), 2013 pp. 1015–1023. doi:10.1007/s11947-012-0784-y. M. Peleg, M. D. Normand, and T. R. Goulette, "Calculating the Degradation Kinetic Parameters of Thiamine by the Isothermal Version of the Endpoints Method," Food Research International, 79, 2016 pp. 73–80. doi:10.1016/j.foodres.2015.12.001. Mark D. Normandand Micha Peleg "Simulating Ascorbic Acid Degradation"